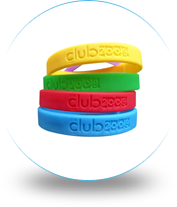 Custom ink-filled wristbands, sometimes referred to as color-filled wristbands, are the highest quality custom wristbands in the industry today. Made with 100% silicone, they are waterproof, completely latex-free, and made to last for years to come. 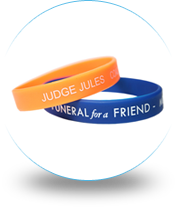 With 100% customizable color-filled rubber bracelets, you get all of the benefits of debossed wristbands, plus the option to choose a contrasting colored ink for your message, design and/or logo. 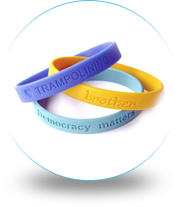 Ink-filled wristbands start off as standard debossed bands. 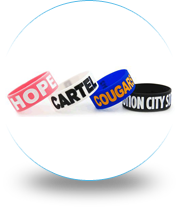 These versatile silicone rubber bracelets are then filled in with silicone-based ink in an alternate color of your choice to ensure your custom message and artwork/logo will stand out. You can choose multiple ink colors depending on your personalized design and pick any combination of colors from Pantone’s color pallet to match your company logo, team uniforms, party theme, foundation’s awareness color, or whatever your creativity leads you to. Ink-filled bracelets are very popular and are a fun and creative way to promote anything you are passionate about! 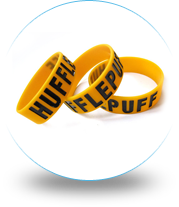 Make Your Wristbands are custom created to fit your needs and can feature any message, phrase, artwork and/or design of your liking. 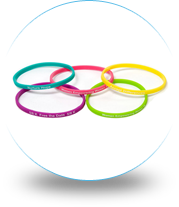 They are frequently used as party favors, for corporate promotions, family reunions, holidays, special events, to show team spirit, as mementos for Sweet Sixteen’s and quinceanera, organization give-a-ways, and so much more… Make Your color-filled wristbands have a polished, high-quality look, and because the ink is permanent, the colors don’t fade like the competitor’s dual layered bands, whose messages fade in a week or two. 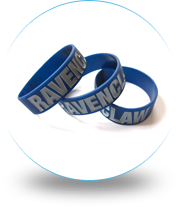 Contact one of our representatives at 1(800)715-4445 for more information about our custom wristbands or to place an order today!